Photo Downloader is an immensely useful application that you may already have on your computer. 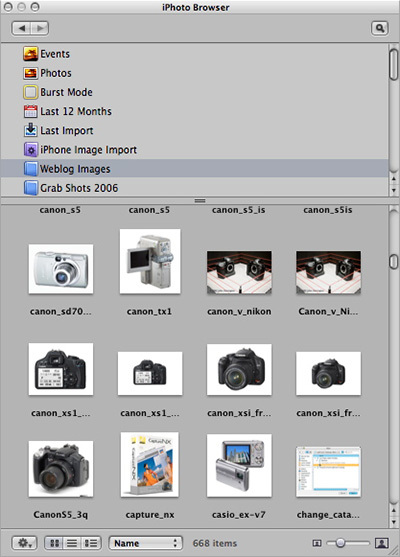 It's part of the Adobe Photoshop CS3 package, and it comes with Photoshop Elements 6 for the Mac. I've posted about Photo Downloader in the past, but during my teaching, I'm still finding that most people don't realize they have it. So in this show, I cover all the wonderful functions of this program. 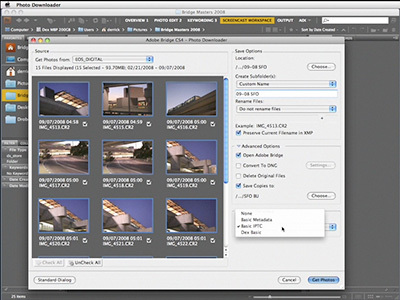 I also describe a bit about how it can become an important part of your workflow, especially if you haven't made the move to Lightroom or Aperture yet. Angular is this month's photo assignment. Just about everything intersects at some sort of angle... lots of possibilities for this one. You can read more about how to submit on our Submissions page. Deadline for entry is April 30. Be sure to download the free reference card that you can print on a standard 4 x 6 sheet of photo paper and carry in your camera bag. The card, titled, "After Every Shoot," lists the 10 reminders that you need to pay attention to at the close of each session. In this podcast, I go over every point on the list. Once you finish listening, download the Jpeg image below and print it on a sheet of standard 4 x 6 photo paper. For best results, print in "portrait" mode (vertically aligned paper), center the image, and scale to fit (see illustration above for settings). You'll then have a handy reminder card that you can carry around. Print as many as you like and share with friends too. You can add your own notes to the back of the card, use it to shade the lens on bright days, or fan yourself if it gets too hot while you're on location. It's also the perfect bookmark for your copy of The Digital Photography Companion. So many uses for this handy freebie. 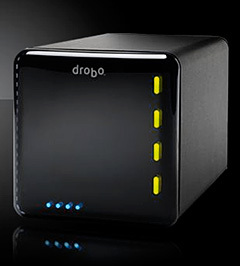 I've gone Drobo, and I have lots to report about networking this robotic storage array. If that sounds intimidating, it isn't. 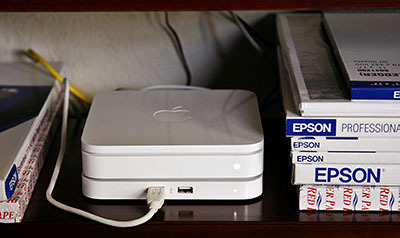 And after listening to this podcast, you might start thinking about putting a hard drive, or a hard drive array (such as the Drobo) on your network to store images. I've also published a couple weblog posts on the subject. Be sure to check out Drobo Hard Drive Back Up for Photographers and on the Inside Aperture site, Alas, No Aperture on my Drobo. Stephen Johnson is a digital photography pioneer. His mastery of traditional technique combined with his forward thinking led him to the new world of digital imaging. In this interview recorded in Orlando, FL at Photoshop World, Stephen talks about his seminal work, On Digital Photography, the evolution of digital cameras including how megapixels fit into that picture, and provides some great advice on how to best display your work. It's a terrific chat that I think you will enjoy. 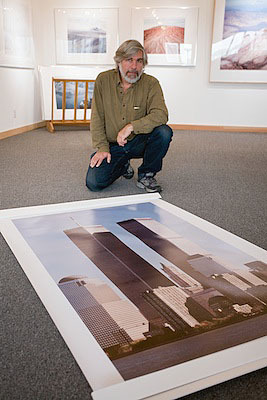 You can find out more about Stephen's ongoing projects and workshops by visiting www.sjphoto.com. Photo of Stephen Johnson in his studio by Derrick Story. So, your telephoto lens isn't powerful enough? No problem. 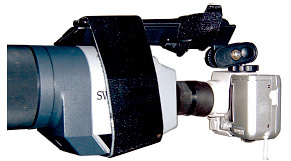 Just find a spotting scope, or any type of scope, and hook up a digiscoping rig. In the podcast, I explain how. You can also download a PDF explaining everything you need to know about DIY digiscoping. It's from my "classic" photography book, Digital Photography Hacks. You can also download another PDF about the Walking Stick Mount, which is another tip that I cover in this week's show. If you only had one digital photography book, would this be it? My biased answer is a resounding "Yes!" The Digital Photography Companion is off the press and headed to bookstores everywhere as you listen to this show. Because you're a member of this virtual camera club, however, you deserve a little inside information. And that's exactly what you're going to get in this podcast -- interesting tidbits about the book that you can't get anywhere else. 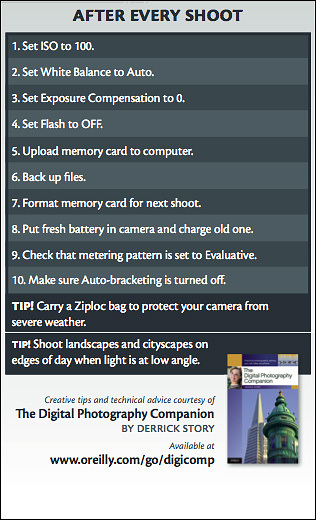 I've also typed up my notes in the TDS post titled, "The Digital Photography Companion": Author's Release Notes. And remember, this is the official camera guide of The Digital Story. It even has the TDS logo on the back. Cameras are useful for much more than just taking pretty pictures. 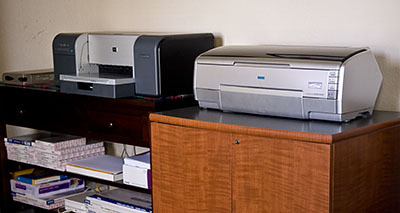 They are sophisticated data capture devices that you can use to record important information. And because you always have a camera with you, even if it's a camera phone, you can use this functionality to make your life easier. In this podcast, I discuss how I use compact cameras to never forget where I've parked, plus lots of other useful applications. This is handy stuff that will make your daily life better. Parking garage sign recorded with an iPhone just after stepping out of the car. 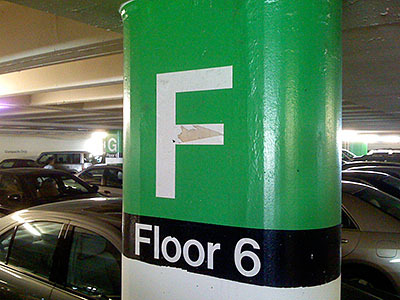 I'll never forget where I parked! Compact cameras can deliver terrific video as well as stills. 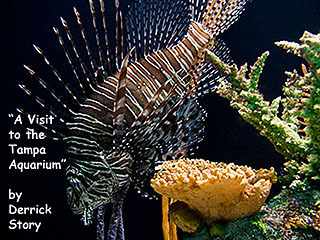 This week's podcast features a movie I captured at the Tampa Aquarium during an evening event sponsored by Kodak at Imaging USA. The lights were on in the ray and shark pool, and I got down low with my G9 mounted on a Gorillapod to shoot the activity through the glass. You can hear conversations I have with passer-bys asking about the camera and its abilities.